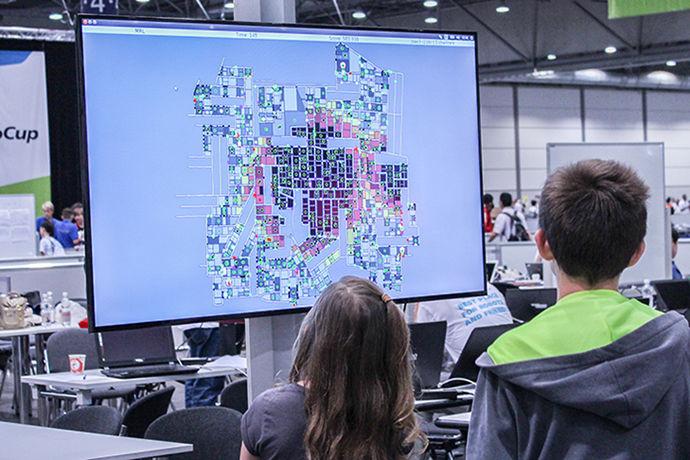 RoboCupRescue is a competition in which participants compete in disaster strategy for rescue operations, using a major disaster scenario, such as that of an earthquake. 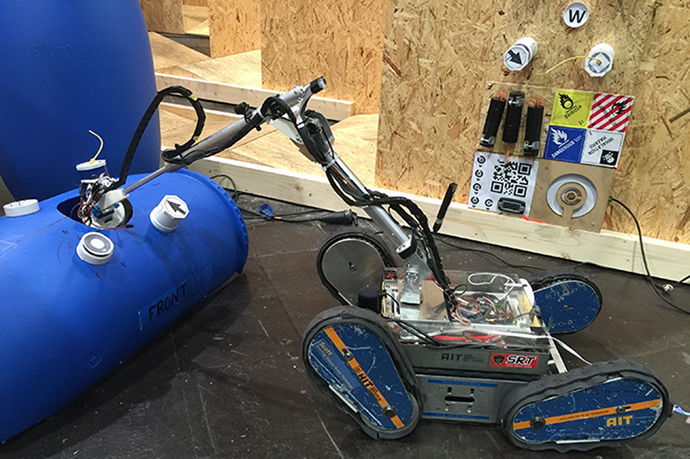 The RoboCupRescue project is divided into two leagues: the Rescue Robot League and the Rescue Simulation League. 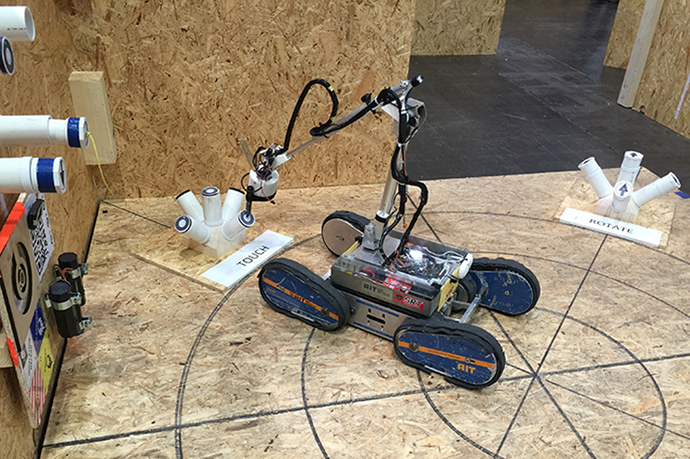 In the Rescue Robot League, robots carry out rescue operations, overcoming rubble and other obstacles, while acquiring information by themselves. In the Rescue Simulation League, a simulator is used to represent a progressing situation in a disaster-affected area on a computer screen, and many simulated autonomous robots carry out rescue operations through team work. In the Rescue Robot League, robots search for several victims placed in a simulated field of a disaster site and discover and rescue them. These robots have mechanisms for both operator control and autonomous operation. They are also equipped with devices such as a camera, a temperature sensor, and a carbon dioxide sensor. 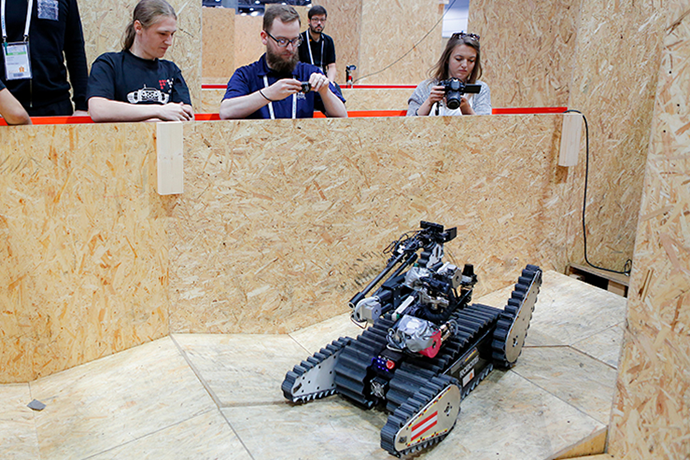 Competitors are scored on various factors such as the number of obstacles the robot overcomes, the number of victims it finds, and the number of operators involved. For example, the competition tests navigation and negotiation—or autonomous negotiation if the robot is an autonomous type—such as passing through a ragged disaster site and overcoming rotating pipes obstructing the way. 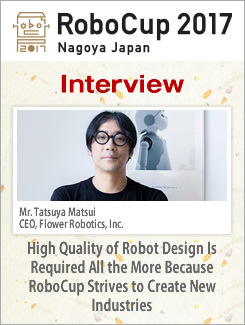 Tasks may include those that require the robot to overcome a vertical obstacle by using a bar in a slanting position to propel itself, to push or pull open and pass through doors, or to perform dexterous actions such as touching, rotating and unlatching. The Rescue Simulation League holds simulator-based rescue competitions simulating a major disaster that has occurred in an urban area built on a computer. The competition requires players to deploy rescue, fire-fighting, and road patrol teams called "agents" to search for and rescue people in need of help. For example, fire-fighting agents extinguish fire, rescue agents rescue people from buildings, and civil engineering (road clearing) agents repair damaged roads. These agents mutually cooperate to search for and rescue affected individuals. The conditions of the affected area are conveyed as visual information, communication data (voice/wireless communication), and information collected by each agent. To check fire conditions and whether there are individuals to be rescued in a building, the agents need to gain access to them. Communication data is transmitted by voice and wireless systems as at an actual disaster site. The term "voice" refers both to the use of voice for exchanging situational information and intentions, and to cries for help from individuals awaiting rescue. Through wireless communication, the rescue center and rescue agents as well as other agents are able to share information. Fire is simulated according to given numerical values, including temperature, the extent of burning, and the extent of collapse. The numerical values change sequentially as the disaster progresses, for example, with houses burning down after catching fire, fire spreading to neighboring buildings, and buildings collapsing. Some people in the simulation may try to walk to an evacuation center by their own effort. Hence, it is important to repair damaged streets to provide safe evacuation routes. This video explains the rules plainly. From 2017, a research competition starts. The Rapidly Manufactured Robot Competition(http://comp.oarkit.org/) encourages high school and undergraduate students to develop innovative solutions to open response robotics problems in Search and Rescue tasks. This competition focuses on the challenges of robots operating in confined spaces and makes use of recent advances in low cost rapid prototyping, electronics and sensors to lower the barrier of entry into robotics research.